How can we reach the beach? You can use the free shuttle train (each 10 min. ), bike crossing our nature park on the bike route or just walk underneath the wonderful pinewood. It is a large, sandy beach, in part private where you can rent sundecks and umbrellas, in part free beach. Water is clear and the beach slopes gently. 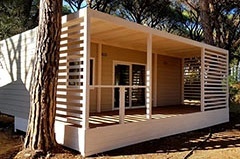 How far is the Natural Park of Maremma (Parco dell’ Uccellina)? About 20 km south direction. What are the differences between Bungalow and mobile home? Bungalows 4+1 sleeps (about 33 m²) are composed of a double bedroom, a bedroom with 3 beds, living room with kitchenette fitted with kitchen ware and cutlery, bathroom with shower and toilet. They have a covered but open sided veranda. They are supplied with TV set and free SKY Sat programs. 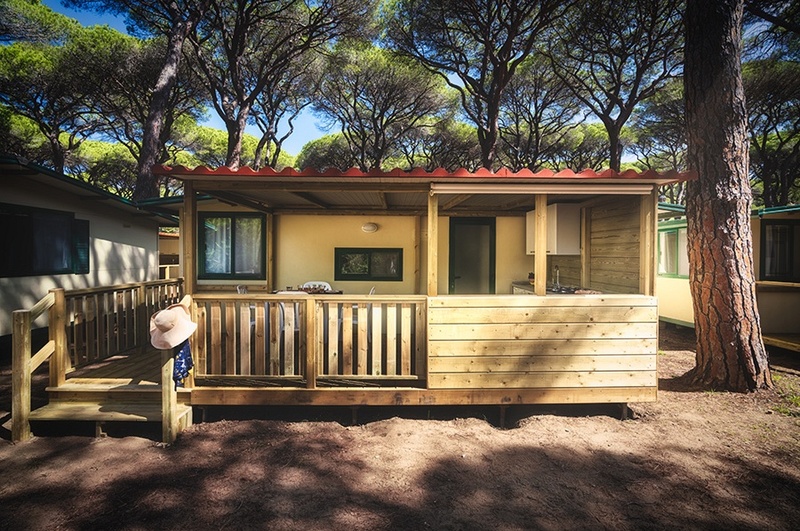 You find this type of accommodation only in the area called Caletra.Mobile homes (about 30 or 35m ²) have a double bedroom, a bedroom with 3 beds, bathroom with shower and toilet and a living room. The cooking and dining space is inside the wooden veranda which is a closed space. 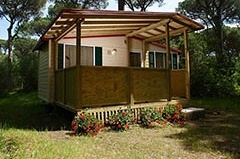 Mobile homes are not equipped with television and they are available in the areas of Salebro, Roselle or Scabris. How are the rental accommodation equipped ? They are equipped with crockery, cutlery, pans and pots and kitchen accessories. We also provide blankets, bedspreads and pillows. All are equipped with safe deposit box, cleaning utensils (broom, bucket, shovel, etc.) are provided. Outside there is a laundry drying rack and a sun lounger. Some of them include bed linen/towels with weekly change. Between 80 and 100 square meters. 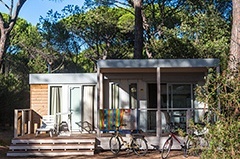 Yes, the camping areas are inside a centuries-old pine forest. Marina di Grosseto and Principina a Mare are the nearest towns, 3km far. Is it possible to leave dinghies and surfboards on the beach? There are no boat docks, so the only way (assuming the boat has no engine of course) is to leave it in our free beach storage beyond the beach dune, where beach accessories and surfboards can be deposited. 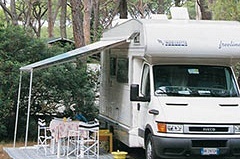 Berths for boats are available in Marina di Grosseto Tel 0564 34310. What are the properties of Cieloverde Caravan? Cieloverde Caravan consist of two bedrooms and a kitchen equipped with hob, cutlery, crockery and kitchen utensils fridge with freezer compartment. The covered wooden terrace has table and chairs. Moreover, they are provided with laundry drying rack, blankets, pillows, sun lounger. Bed linen and towels are not provided. There is no water connection and therefore no bath. Yes, in some of the areas you can rent them. They are supplied with shower, basin and toilet. Can we rent cot and highchair for babies? Yes. The crib is provided with bedding. Do we have to pay a club card? No, the entire entertainment program is included in our rates. Can I park my car in the camping pitch? No, there is an extra shady parking space provided in the vicinity of the pitches. One parking space is for free. Yes, every day emergency service by a qualified nurse. In addition, 4 hours per day medical service. Do we have to pay the final cleaning of rental accommodation? No, the accommodation, however, must be left clean and in good order by the customer at checkout. In some areas there are restrooms with showers and services that are easily accessible by wheelchair. 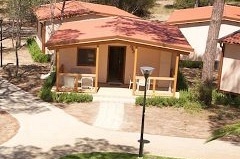 In addition, there are Greensky mobile homes with facilities for wheelchair users. Yes, the entertainment team organizes games and entertainments for kids. Is there a children’s playground? Yes, we have two of them. Yes, almost every night after the show, and sometimes in the early evening, there's disco music on two dance floors. Yes, movies and cartoons are shown for a fee. The nearest tennis courts are about 1 km away. In Marina di Grosseto (3 km) there is a tennis club. Tel 0564 / 35252. Are there a washing machines or dryers? Yes, there are coin-operated machines in different areas of the campsite. Yes, there are two pools. Is the access upon payment? From May 11th until June 14th 2019 and from September 7th until September 21th the entrance is free for all guests until reaching the maximum admitted attendance. From June 15th until September 6th 2019 it costs € 6,00 for the entire ticket , € 3,00 for the reduced ticket (from 3 up to 8 years), children under 3 years are free until reaching the maximum admitted attendance. The entire ticket includes a sundeck. Is there any weekly or monthly ticket? Yes. Weekly ticket: € 18,00 reduced. - € 35,00 entire. 14 days ticket: € 38,00 reduced - € 60,00 entire. Season ticket: € 250,00 reduced - € 400,00 entire. From 9,30 a.m. to 7,30 p.m..
Children under 14 years only if accompanied by an adult. What is the maximum capacity of the pool? Is there a pool for children? Yes, there is one for children until 6 years which is 60 cm deep. Is there a bar at the poolside? Yes, there is always a lifeguard . Half board & Full board? 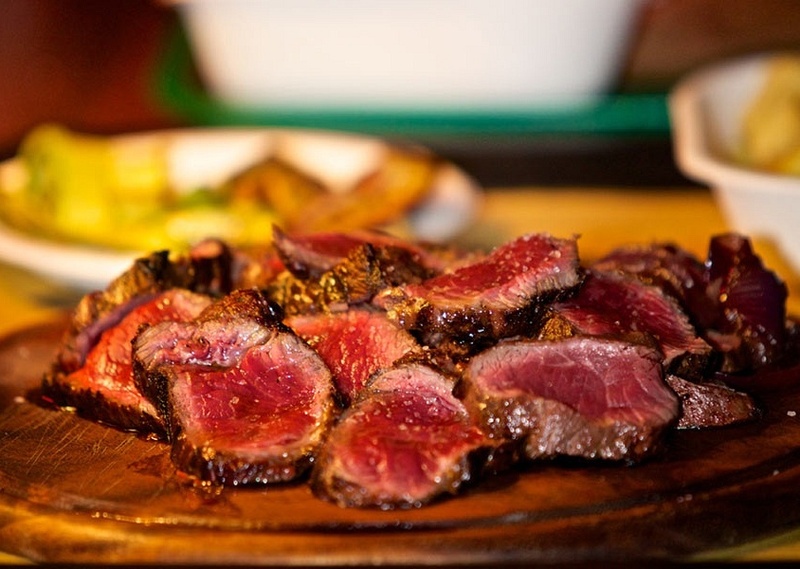 Breakfast and Lunch are served in the restaurant of the village, Dinner in the self-service restaurant. Full board for adults € 245,00 per week per person: hearty continental breakfast buffet at the restaurant and light lunch consisting of cold dish or warm pasta, vegetable salad and half a liter of water. A three course dinner at the self service with a separate waiting line: first course, second course with side dish, dessert or fruit and half a liter of water. Half board for adults € 182,00 per week per person: hearty continental breakfast buffet at the restaurant and a three course dinner at the self service with a separate waiting line: first course, second course with side dish, dessert or fruit and half a liter of water. Full board for children (from 2 up to 8 years) € 196,00 per week per person: hearty continental breakfast buffet at the restaurant and light lunch consisting of cold dish, vegetable salad and half a liter of water. 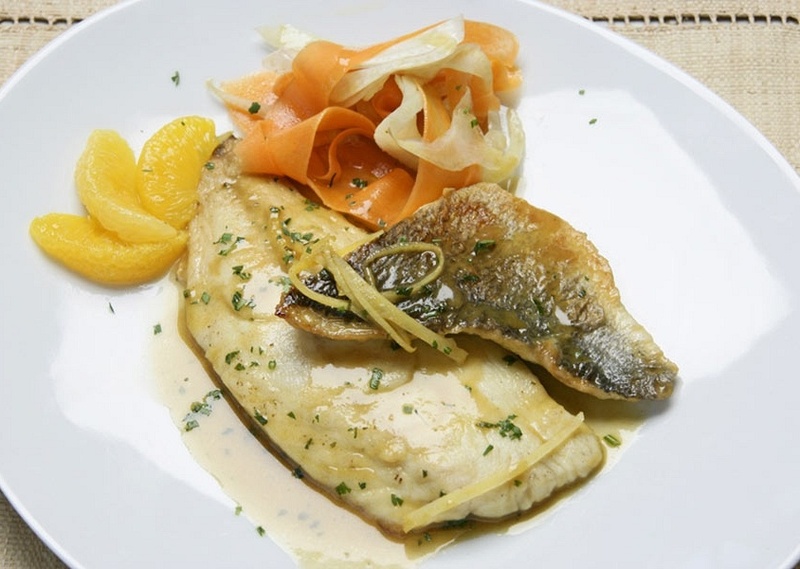 A two course dinner at the self service with a separate waiting line: first course or second course and side dish, dessert or fruit and half a liter of water. Half board for children (from 2 up to 8 years) € 133,00 per week per person: hearty continental breakfast buffet at the restaurant and a two course dinner at the self service with a separate waiting line: first course or second course and side dish, dessert or fruit and half a liter of water. Can you send us your brochure? Yes. They can stay in our. 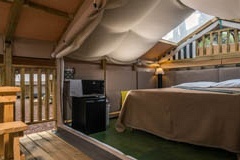 accommodation ( except in the Village mobile homes, Greensky mobile homes, Cieloverde Tent and Bungalow Plus where there are not allowed) at end of the stay a sanitizing cleaning of accommodation is mandatory. Yes, dogs have access to our facility. They pay the currant rates for their stay. They can stay in our rental accommodation (except in the Village mobile homes, Greensky mobile homes, Cieloverde Tent and Bungalow Plus where they are not allowed) at end of the stay a sanitizing cleaning of accommodation is mandatory. Their access to the beach, however, is strictly forbidden. 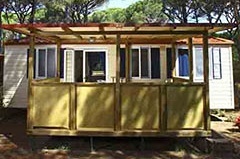 In Cieloverde Camping Village there are off-lead areas for dogs and two pools for the dogs toilet. Furthermore Dog sitting is offered. What can we visit in the surroundings? 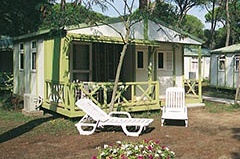 Cieloverde Camping Village is nestled in an area rich of archaeological sites. Very interesting the Roman Etruscan necropolis Roselle, Vetulonia, Sorano and Pitigliano. Also numerous towns in the Middle Ages, the Natural Park of Maremma, the peninsula of Monte Argentario with the islands of Giglio and Giannutri, discover beautiful valleys at the foot of Monte Amiata are worth visiting. Furthermore, cities of art, within easy reach like Siena (70 km), Florence (160 km), Rome (200 km), Pisa (160 km). Do you have winter storage for caravans? Yes, you’ll find the price list on our website. Is it possible to stay for the whole season?